MADE IN USA WITH PASSION! Send Climbing have been designing and crafting the best knee pads in the world for 15 years. Thoughtfully designed by climbers; they know what it takes to make the very best gear because they actually use it! Each and every kneepad and crash pad is lovingly hand made in the United States. They're based out of Hueco Tanks in El Paso, TX, with locations in Estes Park, Colorado as well. Kneebar n, v : is a rock climbing maneuver in which a leg “hold” is created by camming your knee/lower thigh up under or against some blocky, cracky, or roofy feature in opposition to your foot. A solid kneebar might let you take off both hands and de-pump, even on overhanging stone; however, it also requires calf flexion and core tension. A kneebar can do multiple things to help improve your climbing ability. It can allow you to increase your reach. Placing a strategic kneebar connects you to the rock, thus freeing up your hands that would have been used to hold you onto the rock; allowing you to reach much farther to holds you would have had to throw to, or could never reach at all. A kneebar can also give you a much needed rest, a one-handed or no-hands rest. 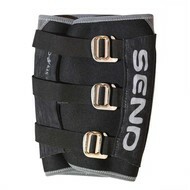 Using a kneepad allows you to place kneebars comfortably because without one they can be quite painful and cause bruising. Knowing how to kneebar is a valuable technique to add to your climbing repertoire AND, it can be done almost anywhere you climb – you just have to know where to look for them...if you know your “Shindex”!